In 1967, Yugoslavia became the first Communist country to allow Billy Graham to preach. It was another 10 years before Hungary opened its doors to Mr. Graham, provided he wouldn’t give political statements against the government. After Hungary, other Communist-bloc nations began letting Mr. Graham in, including Romania. Over an 11-day, seven-city tour in 1985, hundreds of thousands packed churches and public squares to hear the Southern evangelist. This weekend, his grandson, Will Graham, will stand in one of those seven cities, Cluj-Napoca, giving the same Gospel message three decades later. Will Graham will visit one of the same Romanian cities where his grandfather, Billy Graham, preached in 1985. This week, leading up to the Hope Celebration in Cluj-Napoca, local churches are praying unceasingly for the event. The Hope Celebration is Oct. 21-22, and the event team isn’t resting until everyone knows about it. From bike events to citywide prayer time, these enthusiastic coordinators are going full steam ahead. With Moldova to the east, and Hungary and Serbia to the west, Cluj-Napoca is situated in central Romania, surrounded by mountains and medieval towns. Some of its most popular landmarks date back to the 1300s, and today, it’s home to over 60,000 students attending one of several universities, says Marius Mureshanu, head of the Celebration’s media division. 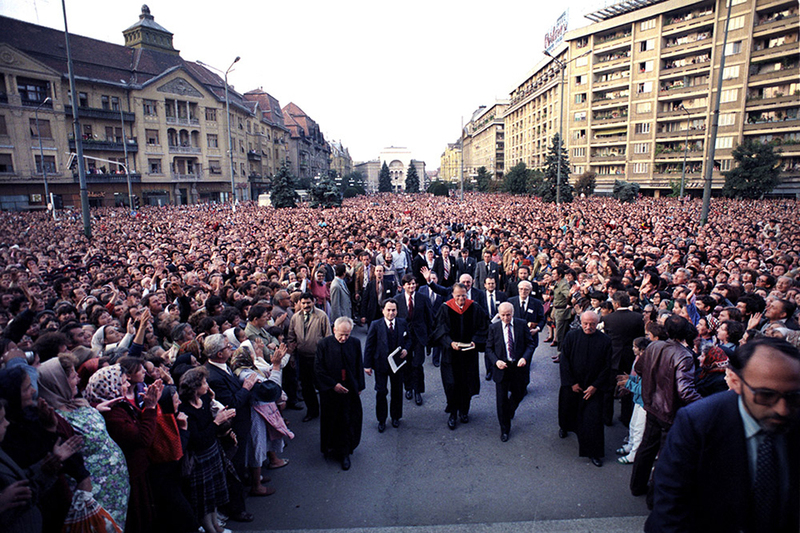 Billy Graham visited seven Romanian cities in 1985 (Arad, Bucharest, Sibiu, Suceava, Oradea, Timisoara and Cluj-Napoca) while the country was still under Communist rule. He preached in Orthodox and Reformed cathedrals, Roman Catholic, Baptist and Pentecostal churches, a Jewish synagogue and in the open air at an Orthodox monastery. In Timisoara, 5,000 people packed the Orthodox Cathedral, with 150,000 outside in the public square. While this vibrant, multicultural city has a lot to offer, Vasily said many Christians there have gotten too comfortable. Marius cites a 2014 survey of Europeans that found Cluj-Napoca to be Europe’s friendliest city toward foreigners. Friendly is great, but it can also mean people are so afraid of offending that they hesitate to share their faith, he said. Back in 1985, when Billy Graham visited Romania during Communist rule, the spiritual hunger was palpable. 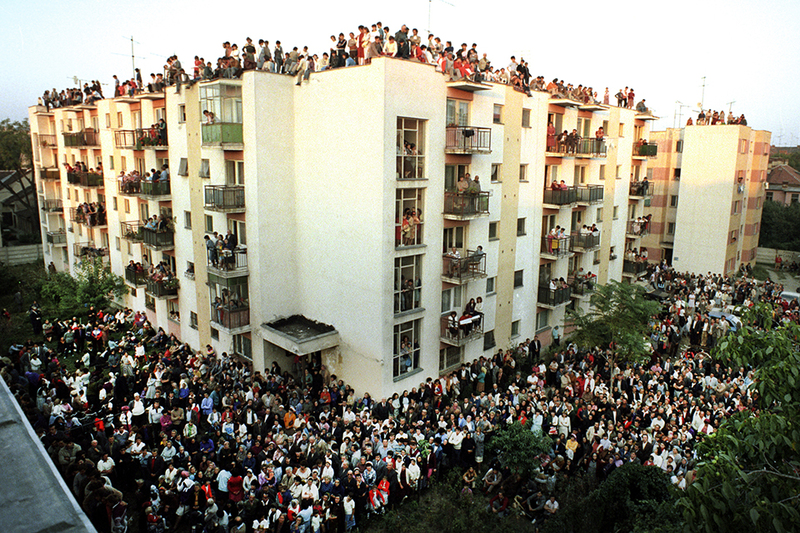 In Arad, people climbed to the roof of an apartment building to hear him preach from a church nearby. In Timisoara, an estimated 150,000 people stood, clapped and took pictures on either side of him as he made his way to the Orthodox cathedral. Today, many in Romania have religion, but living out that faith often ends after Sunday morning. Yet, as the Celebration draws near, Vasily said he’s seen it take people “by storm.” He’s seen Christians get fired up about praying for their friends and inviting them to the Celebration. “It’s like something came and said, ‘Wake up!’” Veronica said. Celebration Director Vasily Gherasimciuc, along with his assistant and interpreter Veronica Bucur, speak to Hungarians who gathered in Cluj-Napoca, inspired by the upcoming event. Veronica has a list of friends she’s praying for. Via Skype, she holds up a typed list of seven names on her phone. Every night at 10 p.m., she gets a notification on her phone to pray over those names. It’s not just for her but for hundreds around the region who set similar reminders to pray for their friends. “Nobody’s sleeping at 10 p.m., but they’re not so busy,” she said about the perfect time for Romanians to pray. One night as Vasily was driving, he found himself behind a car with the Christian fish symbol on the back. At 10 p.m., the car stopped and Vasily stopped, too. As he paused to pray, he noticed the people in the other car praying as well. The two travelers never introduced themselves, yet came together for a brief moment in prayer before going on their way. While the vast majority of Cluj-Napoca is Romanian Orthodox, Marius says the evangelical community is growing. In the past few years, a couple of civil issues have brought the various churches together. One is a proposed referendum to the Romanian constitution to define marriage between one man and one woman; the other was fighting for the return of five children to their Romanian-Norwegian parents living abroad after the kids were seized by authorities. Some speculated religious discrimination at play. Now with the Celebration in sight, churches have another opportunity to come together. “Many pastors testified to us that this is a chance to unify all the Christians,” Vasily said. 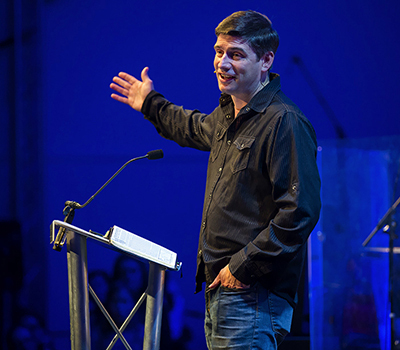 About 400 churches are actively involved in the Hope Celebration with Will Graham. The Celebration team, originally planning for a 1,500-member teen and young adult choir, had to close registration after reaching 1,600 participants. 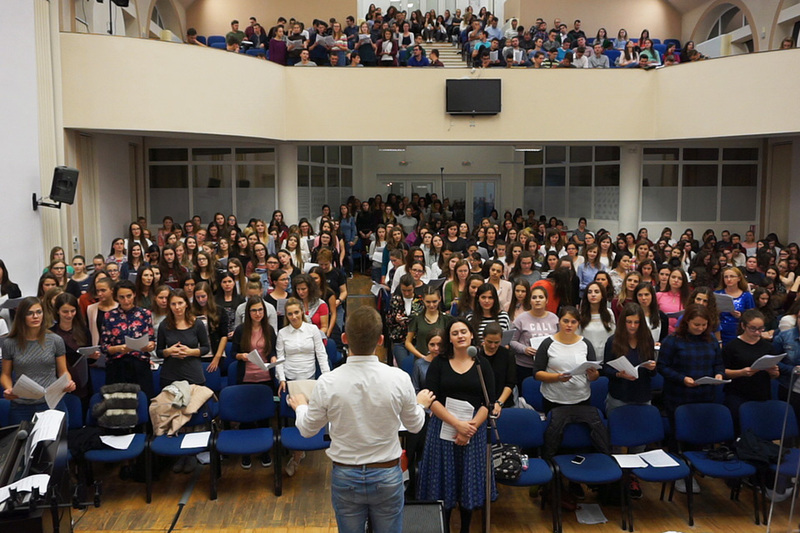 Here’s one rehearsal at Betel Baptist Church in Cluj-Napoca. 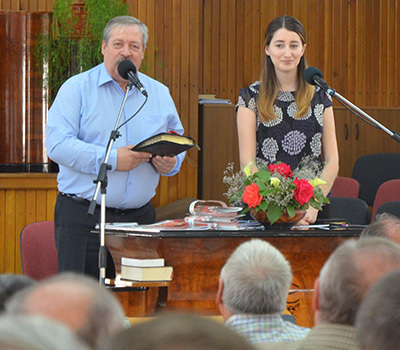 It’s been almost 30 years since this beautiful country was known as the Socialist Republic of Romania, and although remnants of that era still exist, Vasily said the need for Jesus will remain the same no matter what the political situation. “A lot of people don’t have hope, and that’s because their hearts have not been changed, not because of the political party,” he said. Marius recently went into town and asked people if they have hope. Many said no. That’s why he and others on the Celebration team keep inviting people to come. “I want there to be thousands that say, ‘Yes, I believe in Jesus with all my heart,’” Veronica said. And for that faith to never stop growing, she added. Pray for Romania. Pray for Christians there to be fearless when they talk about Jesus, and for all who attend the Celebration to have an open heart as they hear the Gospel.